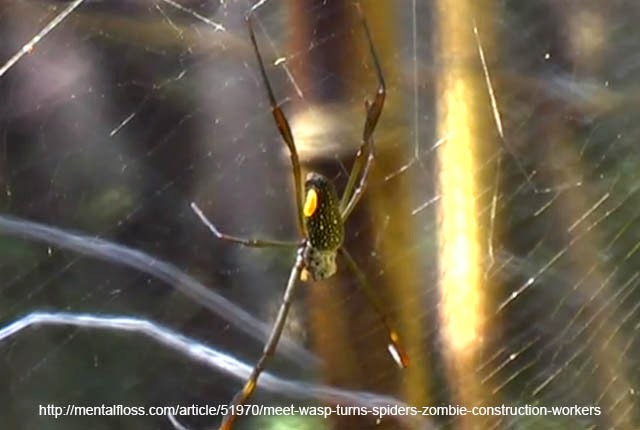 A wasp which uses a spiders web. Hymenoepimecis argyraphaga is another of those parasitoid wasps which controls the minds of their victims in order to feed their young. Its specializes in feeding the spider Leucauge argyra to its young. 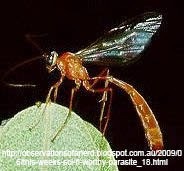 This parasitoid wasp is relatively merciful to its hosts in comparison to others like Ampulex Compressa, Ichneumon eumerus or Pepsini. Their sting only temporarily paralyzes their host, giving the female enough time to attach their eggs on the abdomen of the spider. When the egg hatches the juvenile latches on to the spider. It feeds of the body fluids of the spider while it grows and matures. 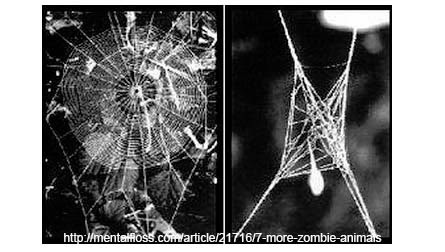 Once it has grown large enough it injects chemicals into the spider's brain which cause it to alter its normal web building behavior. Instead of weaving their sticky thread they will build multiple structural threads and anchor thread. The web is then strong enough to support the cocooned wasp for days in good or bad weather, giving the wasp enough time to mature into an adult. Just before entering the cocoon, the wasp will kill and eat the spider for the nourishment. Hymenoepimecis argyraphaga is endemic to Costa Rica.